When you subscribe you will receive all twelve volumes already published, listed here. Sangharakshita (1925–2018) was the founder of the Triratna Buddhist Community and had a lifetime of teaching and writing; he continues to be Triratna’s principal teacher and guide. 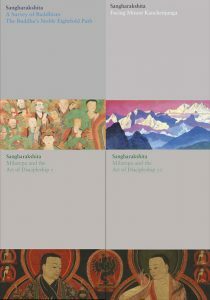 The Complete Works of Sangharakshita includes all his previously published work, as well as talks, seminars and writings published for the first time. This collection of twenty-seven volumes represents the definitive edition of his life’s work. Launched in October 2016, The Complete Works is being published not in strict volume order, but in groups of three volumes ranging over each of the six ‘baskets’ that the collection is divided into: Foundation, India, The West, Commentary, Memoirs, and Poetry and the Arts. See the list of all titles in the Complete Works. at the end of the publishing period you will have all twenty-seven volumes – a beautifully produced and authoritative collection of Sangharakshita’s writings. If you choose a subscription option that includes printed books, you will also be charged for shipping. The shipping costs are the same for both hardback and paperback subscriptions. Please note: Subscriptions are not eligible for either of our membership discounts. Learn more about the Complete Works project on our news page or read about Complete Works progress at The Buddhist Centre online. Here two of the key Complete Works editors, Kalyanaprabha and Vidyadevi, discuss their roles in the project. Here Satyalila and Dhivan talk about their passion for leading study on The Complete Works. Dhivan and Satyalila have prepared extracts from each of the published volumes of the Complete Works for study sessions held at the Bristol Buddhist Centre. They would like to share these extracts as suggestions for others to use as the basis for study and discussion sessions lasting 2–3 hours. Download the extracts here.